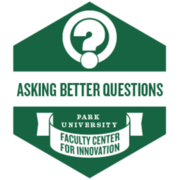 Asking Better Questions centers on revisiting the first radical piece of active learning – the question. The premise is based on the idea that the quality of discussions you get in your courses is directly proportional to the quality of questions you ask. This badge acknowledges participation in a faculty learning community focused on evidence-based philosophies and strategies to pose meaningful questions that support relevant learning.